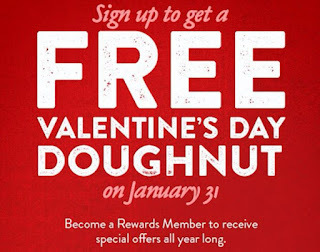 Krispy Kreme Rewards members will earn a FREE Valentine's Doughnut on January 31st. If you're not a member sign up HERE. Offer valid 1/31/18 for Rewards members at participating U.S. Krispy Kreme shops only and is subject to product availability (which may vary by market). Offer valid for one-time use. Limit one free Valentine's Day Doughnut per Rewards member. Not valid with any other offer or coupon.